MOKENA, Ill. (WLS) -- The blizzard that hit the Chicago area last weekend was one for the history books. The storm dropped nearly 20 inches of snow, forcing frustrated residents to do a lot of digging. 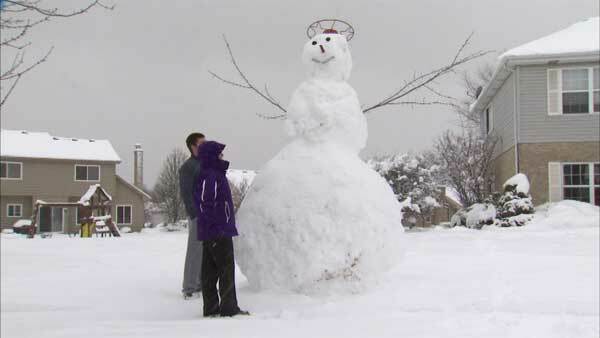 But one family in south suburban Mokena had a bit of fun with the snow this week. Denise Tamberlin's grown sons, friends and relatives built a 15-foot snow giant. They used an upside down Christmas tree stand for a hat, two charcoal bricks and some scrap metal for the face and tree branches for arms. "I was very impressed. I was shocked. They asked me to come out and look at the snowman, and I was like, 'OK, I'll come out and look at the snowman.' But it's like four snowmen!" Denise Tamberlin said.